Child laundering occurs when children are illicitly obtained by fraud, force, or funds, and then processed through false paperwork into "orphans" and then adoptees. Child laundering thus involves illegally obtaining children by abduction, fraud, or purchase for purposes of adoption. My prior work has documented and analyzed the widespread existence of child laundering in the intercountry adoption system. This article argues that child laundering is a form of exploitation, and hence qualifies as a form of human trafficking. Once child laundering is understood as an exploitative form of child trafficking, legal and ethical norms currently applied to human trafficking become applicable. 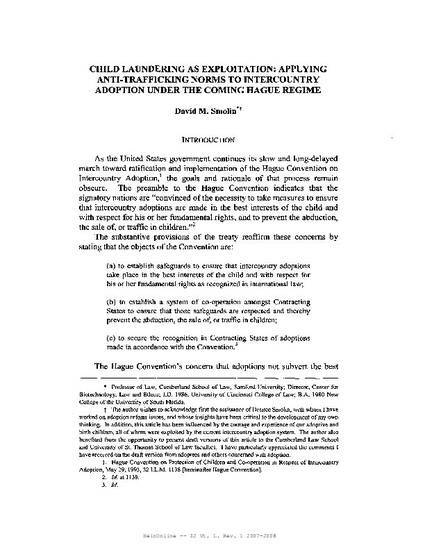 Thus, the Hague Convention on Intercountry Adoption should be implemented according to its intent as an anti-trafficking Convention. 32 Vermont Law Review 1 (2007).